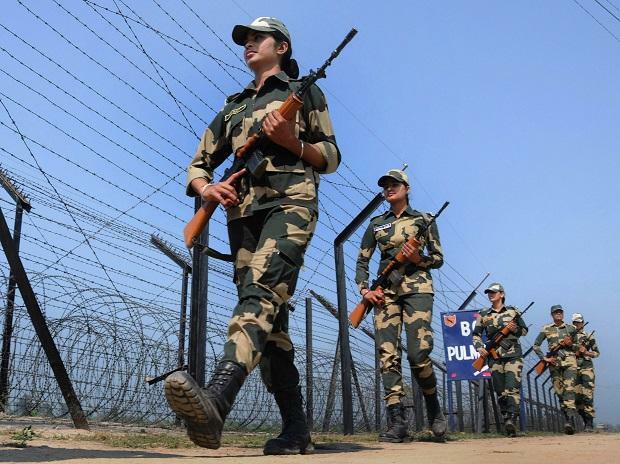 About 400,000 women working in the armed forces and security organisations, who went missing from the voter list in 2018, are missing from the electoral rolls of 2019 as well, the Election Commission (EC) data shows. They were a part of the 1.7-million strong service electorate in India, which comprises nearly 0.2 per cent in the overall electorate of 898 million. Due to this omission, only 3 per cent of the service electorate comprises women. Their share was nearly 30 per cent in the regular scheme of things till 2017, revealed the data. Service electors are security personnel working in the armed forces or in organisations such as Assam Rifles, Central Reserve Police Force, Border Roads Organisation, and Central Industrial Security Force, who are stationed at a place far away from their constituency. Officials aware of the development said: “The EC, after realising that women from the armed and security forces are not casting their vote in successive elections, decided to prepare its list de novo (anew)”. The list of women service voters was thereby scrapped, and fresh applications were sought from them. This is the reason women service electors went down from near 440,000 in 2017 to 22,000 in 2018. They have risen to nearly 44,000 in 2019. Surprisingly, in nearly the same period, male service electors rose from 1.2 million in the 2018 electoral rolls to 1.62 million in the 2019 rolls. Looking back at the decade, service electors nearly doubled from 0.9 million in 2009 to 1.67 million in 2019, growing in the range 1 per cent and 20 per cent every year. Most of them are men. Service voters exercise their vote via postal ballot, which is sent by the returning officer of the constituency to the voter. In the 2014 Lok Sabha election, 1.37 million service electors were eligible to exercise their ballot. While there is no data publicly available on how many of these voters actually voted, postal votes in the election totalled 1.15 million. As a response to a formal query, the EC said that necessary information would be published soon. 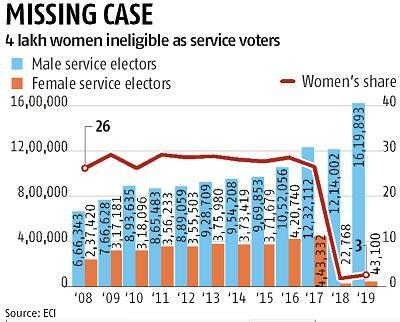 Nearly 40,000 women electors from Maharashtra were knocked off from the service electorate in 2019, compared to 2017. UP, Rajasthan, Punjab, and West Bengal were cut to size by more than 30,000 eligible voters. Male service electors rose by 0.14 million in UP alone in 2019.